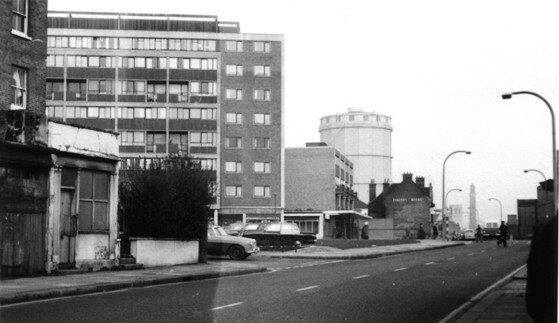 Quentin Pickard has provided this 1960s photo showing the area to the east of St George's Court, near the site of Rattenbury's. Following the demolition of a string of old shops in this part of Brentford known as 'High Ground', Albany Parade flats were erected. The old property on the left is no. 294, next door is the single storey extension to 295 High Street (see a cheerier view from similar point looking west around 60 years earlier). The road to the left from which a Rover 3 litre car is emerging was originally called St George's Court, current maps show it as Wilkes Road. Albany Parade flats were built at an angle to High Street in the 1960s. In the distance the gasometer, multi-chimneyed old Red Lion at 318 High Street, St George's church tower and the water tower of the waterworks are visible. History of 290-296 High Street and 297-318 High Street and previous residents.